It occurred to me yesterday that I never did post last year's Christmas feast. So here it is, one year later. I took a lot more photos last year compared to this year, so it's a bit of a picture heavy post. 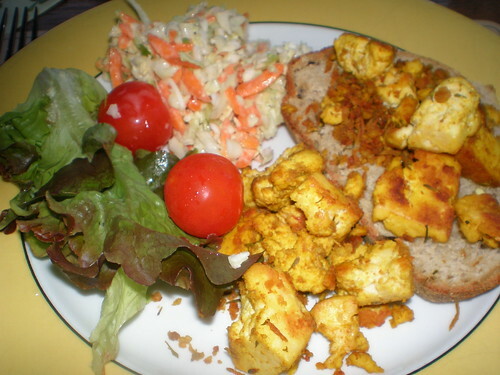 Christmas Eve dinner was Basic Scrambled Tofu from Vegan Brunch with Creamy Coleslaw from 1000 Vegan Recipes and olive and thyme sourdough bread. 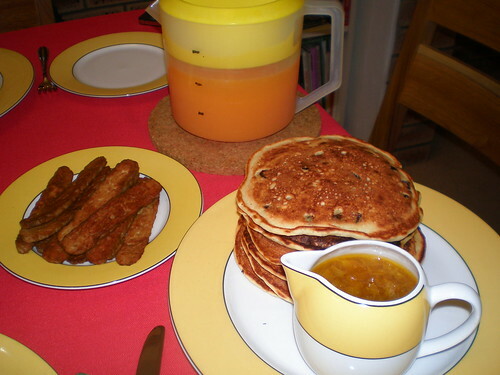 Christmas Day breakfast was Perfect Pancakes and Tempeh Bacon Revamped, both from Vegan Brunch. I made my own cranberry sauce for the first time. 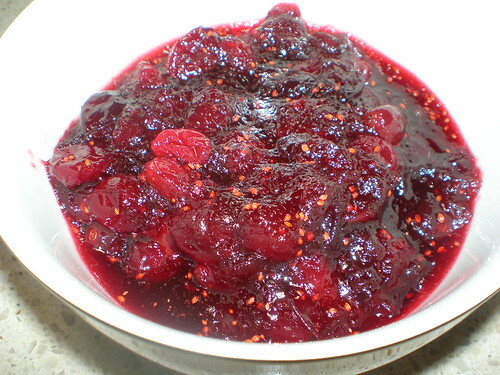 It is Traditional Cranberry Sauce from Eat, Drink & Be Vegan. Delicious! Jarred sauce pales in comparison. 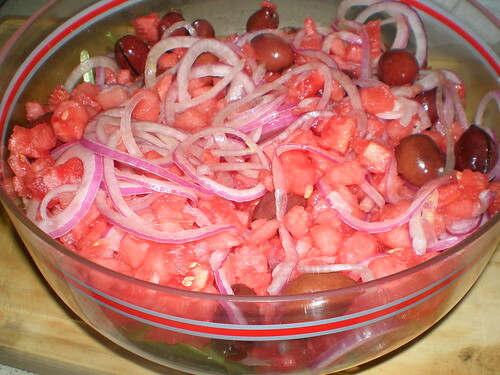 My brother made this delicious and refreshing watermelon, olive and red onion salad. 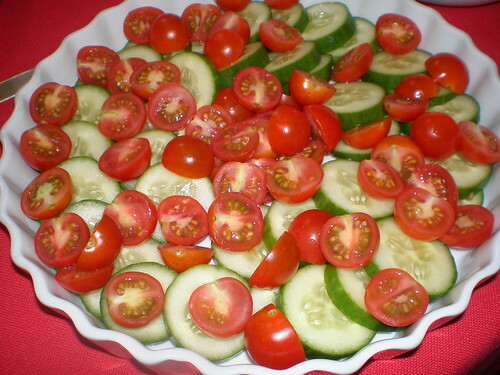 A festive cucumber and tomato salad. 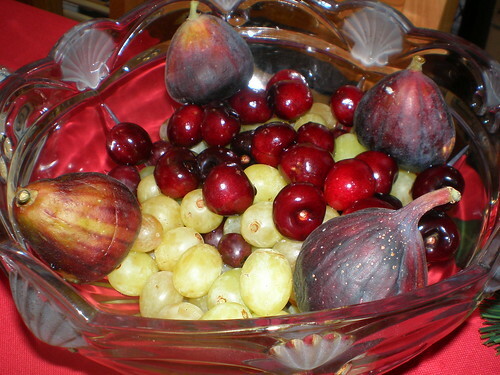 Just right in summer! 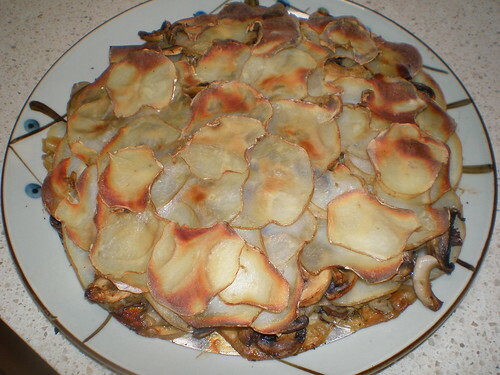 Potato and Mushroom Galette. 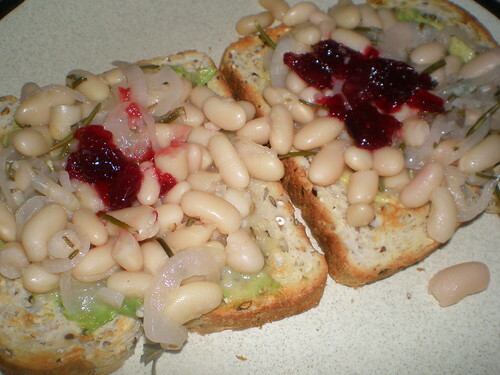 I have made this most years for a long time, it was one of the first recipes my mum started making at Christmas once I went vegan. I didn't make it this year (2010) though. 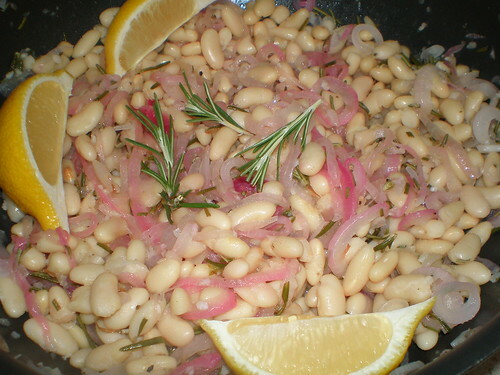 The Rosemary White Bean Salad from Donna Hay again. 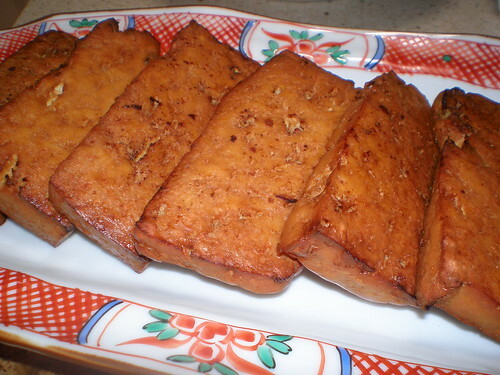 Marinated and baked tofu. I don't remember what I had marinated it in. 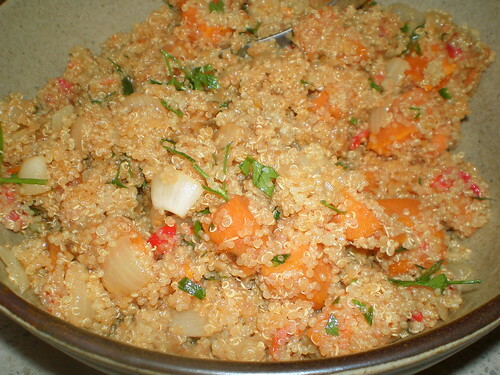 Rustic Quinoa and Yam Salad from The Garden of Vegan. 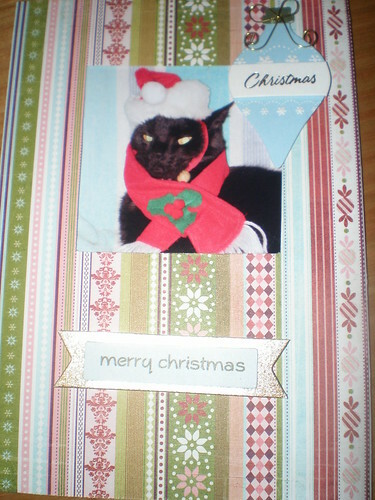 Last year I made Christmas cards with my cats as the stars. Here is a Dim Sim card. Possum got his reindeer antlers on. 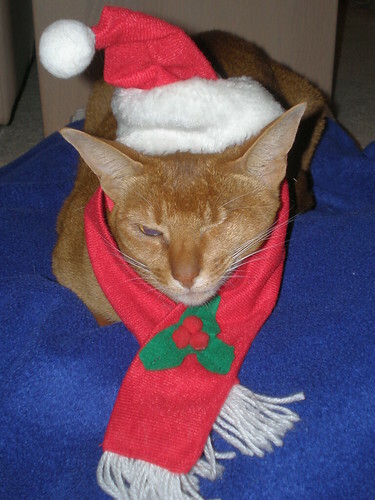 And Sahara dressed up as well. She totally wanted to do this. I promise. Phew. Those posts were meant to be a series last year I think, so thanks for bearing with me as I just unloaded them all off in the one post. I hope everyone has been having a wonderful holiday season! I have been having a great time - I have five days off over Christmas this year so I am feeling quite relaxed and happy. 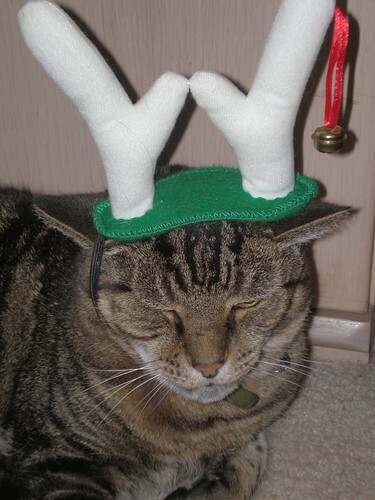 It has been good, because initially I seemed to have lost my Christmas spirit this year... I didn't bake any holiday goodies for the kids at work, and I was just not quite feeling merry or bright. But thankfully that has all changed! Our family eating traditions begin on Christmas eve. While the omni family tradition is prawns (eww and ick) with mayo and white bread, I am in the habit of making something fun and new each year. I was working Christmas eve until 5pm as well, so something that could be made ahead or pulled together quickly was in order. Here is my plate. I enjoyed Potato Salad with Artichoke Hearts and Grape Tomatoes, basmati rice, grilled portobellos with Lemon-Basil Sauce and leafy greens. 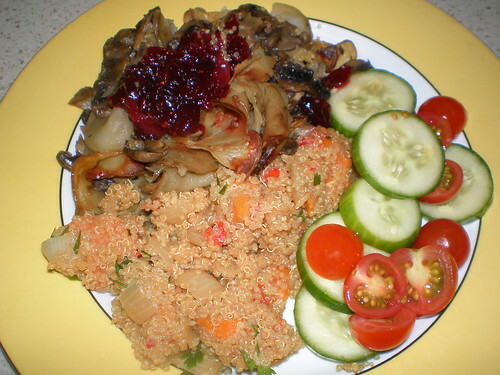 The salad and the sauce were both from my trusty tome 1000 Vegan Recipes. The salad was great, and the colours made it quite Christmas appropriate! I made it the day before Christmas eve and it kept really well in the fridge for a couple of days (I just finished off the left overs yesterday). The sauce I was also able to make ahead and reheat that evening. It was delicious! 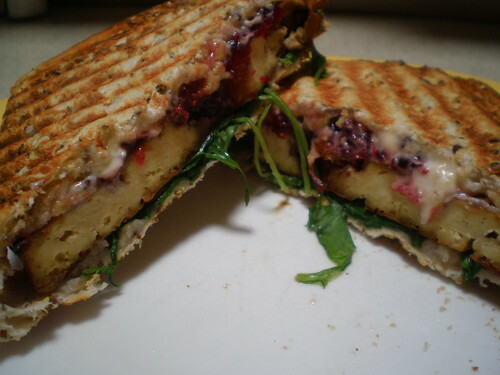 Tangy and sparkly but also very rich thanks to the vegan butter stirred into it. 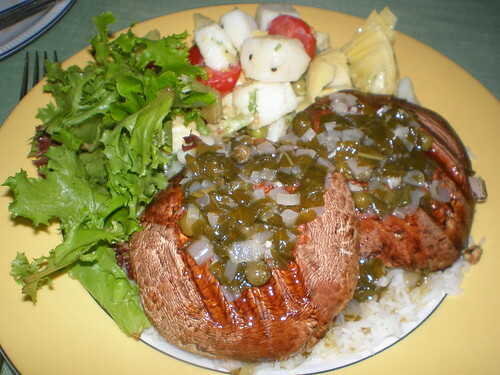 Great over mushrooms and rice, as suggested by the book. Christmas morning dawned and our breakfast table was spread. 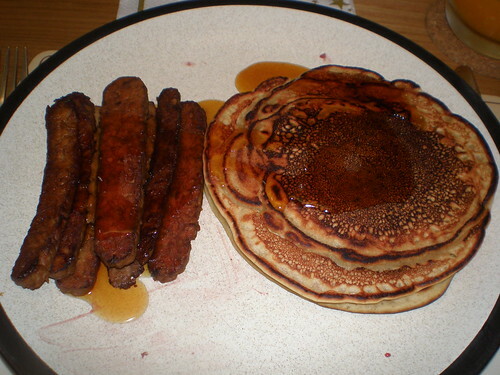 For the last few years I have taken to making pancakes and tempeh bacon for my Christmas breakfast. All washed down with fresh orange juice provided by my brother (who miraculously made it home from England - his flight was only delayed 90 minutes out of Heathrow while there were still people who had been waiting days... lucky star!). The pancakes this year were Cranberry Pancakes with Orange-Maple Syrup and they were served with a side of Tempeh Bacon... and yes, both of these recipes were from 1000 Vegan Recipes. The pancakes were wonderful. I had made the batter the day before and stashed it in the fridge overnight. The batter included silken tofu, so maybe that was why these pancakes were so darn filling! With soaked dried cranberries in the pancakes and topped off with a rich orange-maple syrup... yum! 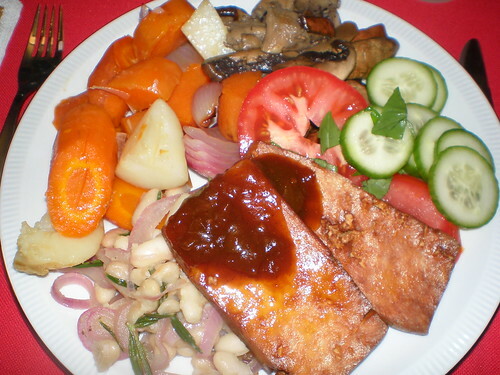 I also really enjoyed the tempeh bacon recipe. It didn't require any marinade time, just pan-fry the tempeh and then splash on the flavourings, and for something so quick it was delicious. 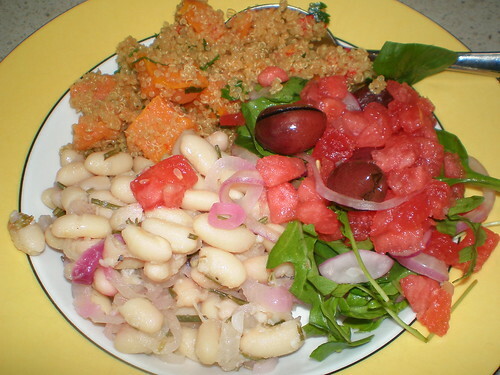 Definitely a keeper recipes for those times you must have tempeh bacon but don't have the time for a marinade. After breakfast it was time for presents! A break in tradition, normally we did presents before breakfast but we were all just getting too hungry in previous years, so we swapped it around. I am happy to report that Santa was good to me this year. My main present (combined with my birthday) was a new camera! It is a Canon something or rather Powershot, with a 35x optical zoom... just because. I didn't want an SLR because I am just not that into photography to spend the time to learn to use it, but I needed something better than my poor old little Olympus point and shoot. This is a great compromise, and I have taken some nice photos of the kitties with it thus far. It should make my food photos a lot better too! I also got the DVD of Scott Pilgrim, a beautiful Japanese vegan cookbook, some vegan skincare from London and lots of vegan noms - including some Booja truffles and some Montezumas vegan truffles from London (I loved these at the Brighton Vegan Fayre last year). Apparently there are some other DVDs on the way as well. The kitties got a new water bowl, a Santa string toy, some Christmas meece, a feather ball and some Greenies. 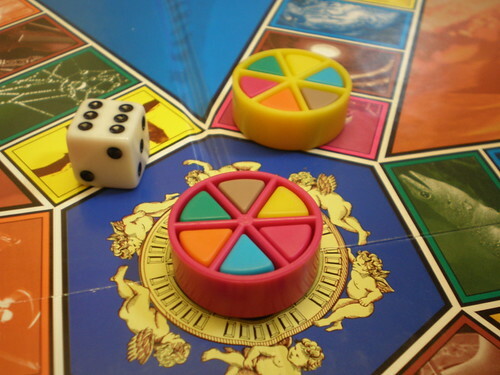 After presents we broke into our traditional parents vs. kids Trivial Pursuit game. This year I am happy to report that kids won! Hurrah! Apparently I sometimes have strange but accurate knowledge. Also sometimes I am good at psychically guessing things. Here is our winning wheel, all full of chips, in the centre after the winning question (the answer to the question, sadly, was cheese). Greg and I are always the pink wheel, which is very nice of him, because pink is my favourite colour. And finally, Christmas lunch. 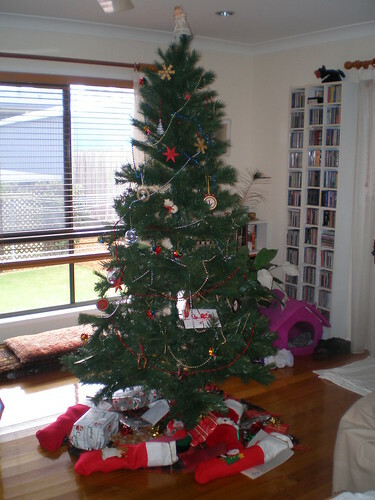 Mum and I decided to keep it simple this year, and I was glad for that. This tasty vegan plate included (from the top and working clockwise) sauteed mushrooms (they were meant to have peas as well, but I accidentally maybe may have put the peas in to defrost for 20 minutes instead of 20 seconds, thus rendering them shrivelled little nuke balls), cucumber and tomato salad, Soy Glazed Tofu from 1000 Vegan Recipes with tamarind chutney, Rosemary White Bean Salad (from Donna Hay Magazine #44) and roasted vegetables. I have since then eaten through most of the vegan leftovers, not to mention started nibbling away at my stash of vegan treats! I hope everyone had a fabulous Christmas, however you celebrate it or whatever it means to you, or at least a fabulous few days off work if nothing else. 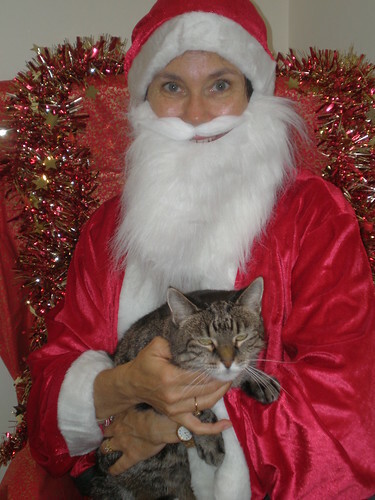 I was going to end this post with photos of the kittens dressed up in their Christmas outfits, but they escaped that indignity this year. So just imagine it, or look back to this post to see just how cute my girls are all dressed up!